The new edition of a classic text about advertising creativity: how to find great ideas and express them freshly and powerfully. 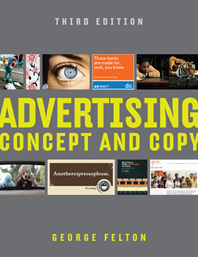 A classic text now in a new edition, George Felton’s Advertising: Concept and Copy is an innovative approach to advertising creativity. It covers the entire conceptual process, from developing smart strategy to executing it with strong ads—from what to say to how to say it. Part 1, Strategies, operates on the premise that the idea beneath an ad’s surface determines its success. This first section shows how to research products, understand consumer behavior, analyze audiences, and navigate marketplace realities, then how to write creative briefs that focus this strategic analysis into specific advertising objectives. Part 2, Executions, explains how to put strategy into play. It discusses the tools at a copywriter’s command—creating a distinctive brand voice, telling stories, using language powerfully and originally—as well as the wide variety of media and advertising genres that carry and help shape messages. But great executions are elusive. So Part 3, the Toolbox, gives advice about how to think creatively, then presents an array of problem-solving tools, a series of techniques that advertisers have used repeatedly to produce exceptional work. In brief, this book shows how to find strong selling ideas and how to express them in fresh, memorable, persuasive ways. The new edition features greatly expanded discussions of guerrilla advertising, interactive advertising, brand voice, storytelling, and the use of social media. Hundreds of ads in full color, both in the book and on an accompanying Web site, demonstrate the best in television, radio, print, and interactive advertising. 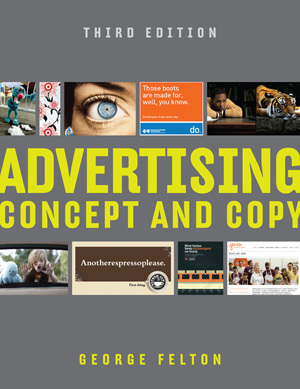 Advertising: Concept and Copy is the most comprehensive text in its field, combining substantial discussion of both strategy and technique with an emphasis on the craft of writing not found elsewhere. It is truly a writer’s copywriting text.